A couple weeks ago, Ubisoft released a refreshed version of the old-school classic Prince of Persia. Since then, we've spent some time checking out this upgraded title and have a few words to share. Much like the Beach Buggy Blitz review, this one will be handled in the video format. 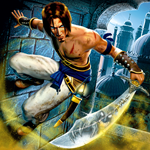 Without further ado, here's a look at Prince of Persia. There are both free and paid variants of PoP in the Play Store - hit the respective widget below to give it a shot. Cameron Summerson contributed the text portion of this review.